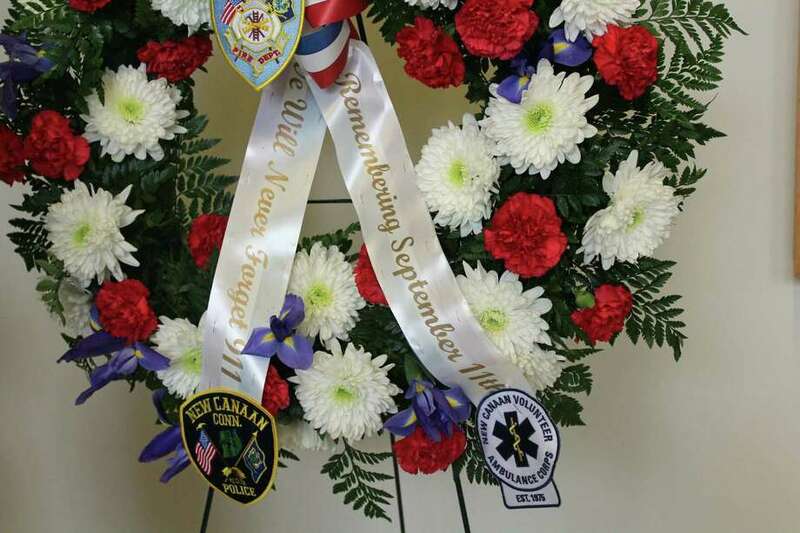 Wreath in honor of 9/11 and the three New Canaan residents who perished in the attack. NEW CANAAN — 17 years later, New Canaan remembers. The 9/11 observance ceremony brought a mix of public servicemen, elected officials and citizens to Town Hall to pay their respects. While people began trickling in around 9:30 a.m., the event itself began at 9:59 a.m., at the same time the South tower of the World Trade Center collapsed. The ceremony was also dedicated to the remembrance of three town residents who perished in the attacks -- Joe Cappo, Brad Fetchet and Eamon McEneaney. Police officers, emergency medical services personnel, firemen and other first responders lined up along the walls of the lobby, in full uniform and regalia. “Families of New Canaan can make sure their children learn the lessons of 9/11… Each of us can serve and contribute as we can to help make our town, our community and our country stronger, safer and better,” Moynihan said. Pastor Eric Fjeldal from the United Methodist Church in town gave the invocation which was followed by ten seconds of silence. Following a tradition set by the fire department, the ring station bell was rung a total of 15 times. Concluding the ceremony was Captain Nancy Upton of the New Canaan Volunteer Ambulance Corps who sang God Bless America.